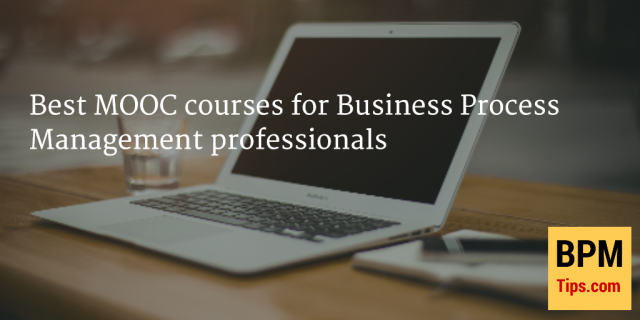 Are you interested in BPMN? Do you want to see how to move from designing a process to automation? 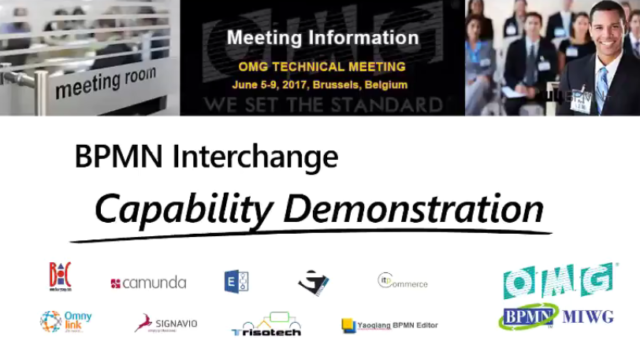 On June 5th 2017 during OMG Technical Meeting in Brussels BPMN Model Interchange Working Group (BPMN MIWG) presented the Interchange Capability Demonstration. Below you can see the full recording of the event. As you will learn from the introduction done by Denis who chairs the BPMN MIWG, the goal of our group is to make BPMN interoperability true. What does it mean in practice? Well – if you write a text document in Word, you would expect that content and formatting will be preserved if your colleague opens it in Google Docs – right? BPMN is a standard notation for modelling processes. What you create are models, not just pretty pictures. So you can create a process diagram in one tool, send it to your colleague who is using different tool for feedback and extensions and move the ready “business diagram” for your IT specialists who will use it for automating the process. You do not need to re-create a diagram in each tool. You do not need to worry about problems with distorted diagrams. Not only visible attributes (e.g. task types) can be preserved but also hidden attributes that are part of the spec or are execution vendor’s extensions. Sounds obvious? It was not that obvious in 2013 when the group was started. Before that each vendor had to interpret the specification and test their solution with few selected tools to see if everything is fine. This was hard, time consuming and resulted in many problems with exchanging models. 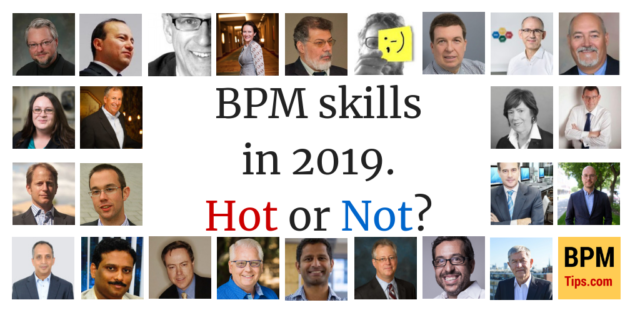 Luckily for the world (or at least this part of the world interested in BPMN 🙂 Denis Gagne from Trisotech started the BPMN MIWG and vendors interested in BPMN (including BOC Group) got a chance to work together to improve their tools interoperability. Since this time we did 6 public demonstrations of the interoperability (including the last one in Brussels), prepared over 10 test models and performed tests of over 30 tools (both modelling and automation). Below you can see the preview of the table with test results. Please note it was not updated after the last demo yet (and does not show e.g. results of ADONIS NP). On the BPMN MIWG page you can see all details of our work – including past demos. During this demo we were collaboratively modelling few interrelated processes of new employee onboarding. The demo scenario was inspired by a process prepared for new ADONIS NP training videos (ADOmoney Bank case study). The initial models were afterwards extended by Francois from W4 and tweaked by the whole group during few months of preparations for the demo led by Denis. Why did we need so much time to prepare? It’s because for the first time we were exchanging that many “hidden attributes”. Plus for the first time we tested importing and exporting many diagrams in one file. 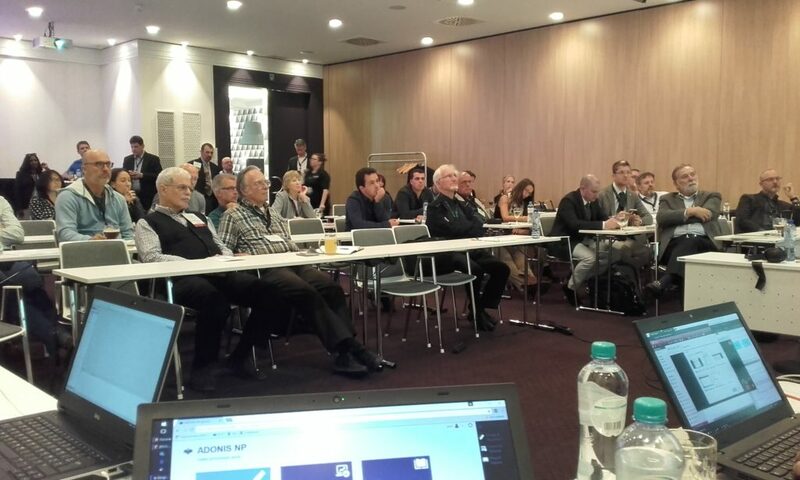 Below you can see a picture showing the processes and how were they split into various tools participating in demo. Common question I got was: Why did you use 9 tools to model 4 diagrams and did it in parallel? Answer is simple: we wanted all the modelling tools to participate actively and did not want to bore the viewers by showing everything in a sequence. At 8:40 you will see how Tim starts modelling the (main) Onboarding process with Yaoqiang BPMN Editor. Now Tobias from Signavio steps in and starts modelling the IT process and afterwards Boris from CaseAgile creates second lane of the main pool. When Tim, Tobias and Boris finished their models (please note that invisible attributes were added in this part e.g. Data Store parameters by Tim) they saved the diagrams to a common Dropbox repository and second wave of participants joined around 12:48. I started by importing Tim’s diagram to ADONIS and extending it. Francois from (ITESOFT) W4 did the same with model created by Boris, while Antonio (from ITP commerce) continued work of Tobias. If you look closely you can see that we show hidden attributes added by our colleagues one step earlier (e.g. I am showing Data Store unlimited plus xsd:string definition added by Tim using special feature of ADONIS which allows you not only to take over any data from other tools, but also view and edit it). Around 17:48 things are getting really busy (luckily Denis was providing narration all the time). Francois had a big diagram to create, so he continues, while next round of participants joins: Simon from Trisotech (who will be merging all the diagrams), Falko from Camunda (who will be modelling the Payroll pool) and Alessandro from Esteco (modelling Facilities pool). 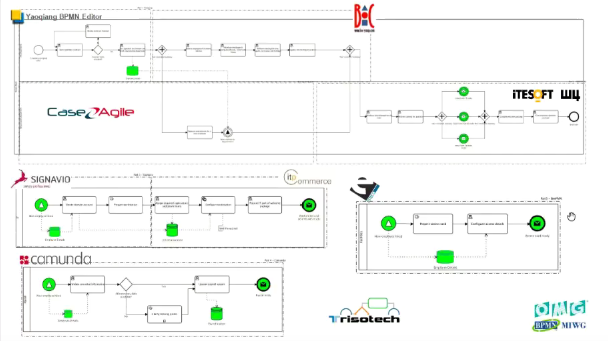 When all the diagrams were done and merged by Simon, Boris returns (at 25:52) to show the result in additional tool: BPMN View. At 26:30 the models are moved to the automation tools. Only selected parts of the process were shown in order to save time, but the results were impressive and the audience liked it. You could see how our process is automated on Omny Link (presented by Tim), Camunda (presented by Falko) and W4 (presented by Benjamin). Please note that automation did not happen “automagically” in a matter of minutes. Our colleagues were using models from our previous session since automation of a process takes some time (especially if you need to add some nice looking forms, provide integration with other systems etc). However after the event Falko showed me how to move from a simple diagram to a proof of concept automation in a matter of 15 minutes. While sitting in a train! 1) BPMN allows you to interchange diagrams between various tools. 2) You can model “business diagram” in one tool and move the diagram to the automation tool where it will be extended with needed details and executed. And than you can move the diagram back to the “business tool” (it’s called “roundtrip”). 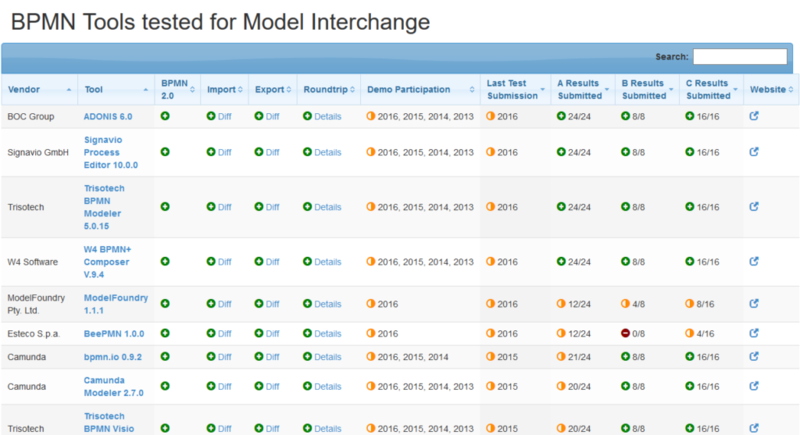 3) If you want to see how your current (or potential) tool supports BPMN interchange you should take a look at the BPMN MIWG page and see the demo recordings plus test results. There was also a press release about it. One of my favorite BPMN 2.0 features are intermediate events. While it is relatively easy to grasp the concept of start events and end events, not everyone understands intermediate events and I get lots of questions from my students about them. I recently updated the video about intermediate events for my course on Udemy and thought it can be useful for you too. What were your plans for 2016? Eat healthy food? Exercise daily? 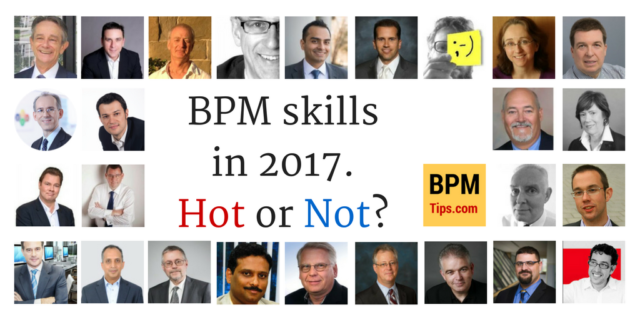 Learn the basics of BPM? 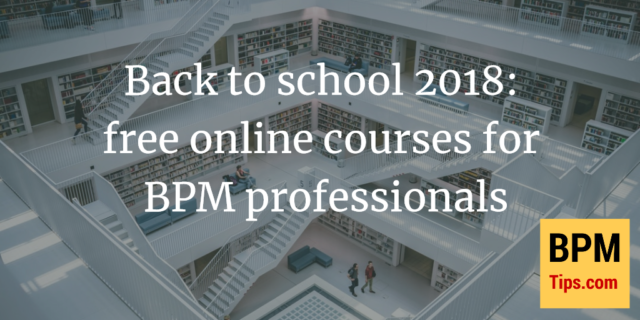 I already covered some great courses for people interested in BPM for 2015 and early 2016 and today I am happy to share with you list of (free) online courses for the second half of 2016.